It’s a new year and the perfect time to think about reviewing your financial situation. There are going to be a number of important changes this year so make sure you’re prepared. Our spring newsletter will help to remind you of what’s coming up in the world of financial planning. We hope you enjoy reading it. 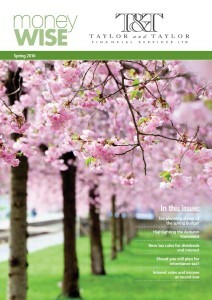 Our feature this edition is Tax planning ahead of the spring Budget. At the end of last year, the Chancellor announced that the spring Budget will be delivered on 16 March. The third Budget in the space of 12 months is a signal that you should start your year end tax planning earlier than normal. With a bit of forward planning and sound advice, you’ll be well-prepared for the year ahead. New tax rules for dividends and interest The Spring and Summer Budgets of last year saw changes to the tax treatment of investment income starting in 2016/17 – and they could make savings for you in the coming tax year. Highlights from the Autumn Statement Mr Osborne’s 2015 Autumn Statement was almost like another Budget. Both tax and additional homes and automatic pension enrolment featured in his announcements along with a raft of other measures.